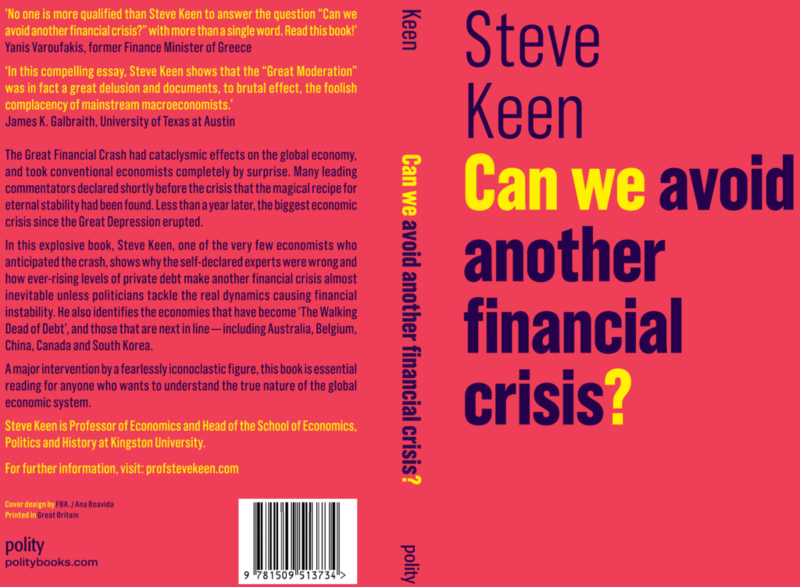 Home / Steve Keen's Debt Watch / Can we avoid another financial crisis? 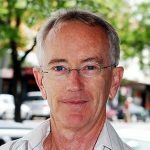 Help me rebuild economics at https://www.patreon.com/ProfSteveKeen Can we avoid another financial crisis? In 2008, conventional economics led us blindfolded into the greatest economic crisis since the Great Depression. Almost a decade later, with the global economy wallowing in low growth that they can’t explain, mainstream economists are reluctantly coming to realise that their models are useless for understanding the real world. How did mainstream economists not see the crisis coming? Was it unpredictable, as they now assert, or did their theory blind them to the real causes? 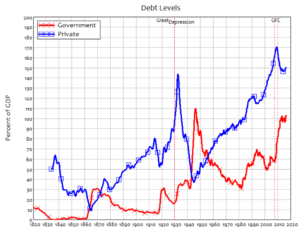 Will another financial crisis occur? These questions and others are asked and answered in Can we avoid another financial crisis? , a short (25,000 word) explanation for the lay reader of how we got into this economic mess, and why we are unlikely to get out of it. The book is available now in the UK. It will come out in mid-May in the USA. A e-book version will also be available in May. Support my work by becoming my Patron on Patreon. Economics is broken, and Universities won’t fund the repair job. Research funding is controlled by and goes overwhelmingly to Neoclassical economists. In 2008, conventional economics led us blindfolded into the greatest economic crisis since the Great Depression. Almost a decade later, with the global economy wallowing in low growth that they can’t explain, mainstream economists are reluctantly coming to realise that their models are useless for understanding the real world. How did mainstream economists not see the crisis coming? Was it unpredictable, as they now assert, or did their theory blind them to the real causes? Will another financial crisis occur? These questions and others are asked and answered in Can we avoid another financial crisis? , a short (25,000 word) explanation for the lay reader of how we got into this economic mess, and why we are unlikely to get out of it. The book is available now in the UK. It will come out in mid-May in the USA. A e-book version will also be available in May. Support my work by becoming my Patron on Patreon. Economics is broken, and Universities won’t fund the repair job. Research funding is controlled by and goes overwhelmingly to Neoclassical economists. Innovators outside the Neoclassical mainstream aren’t even considered for positions at leading Universities, and have to survive if at all at lowly ranked institutions where their existence is subject to whims of government policy. If you want a new economics, you–the public–are going to have to fund its development directly. Next What if my analysis is used for evil purposes?